Every summer we plan a trip with our best friends. Our two families have all the ingredients for a successful vacation: kids who get along great, husbands who are friends and moms who adore one another. All of us share an adventurous spirit and an easy-going attitude. This year’s plan was a long weekend in Birmingham, Ala. There was a music festival, plenty of activities for the kids, and a healthy amount of history and culture. We had a winner! Between us we are eight strong, so we planned to meet after a roughly five-hour car ride, until a friend suggested that we take the train. At first the idea was surprising, but, after some research, we found that travel time only increased a few hours and the cost difference was negligible. The biggest bonus: we got to start our vacation a full day sooner. Riding instead of driving meant that, in lieu of strapping our kids into car seats with only a sibling to entertain, our kids could play together while we traveled. The adults got extra leisure time as well. So we booked our train travel; talked up the experience to our kids; and then headed to the station early Friday morning. We were surprised to find that the seats were comfortable and roomy. They extend back fully and had footrests, which the kids loved as they were able to stretch out and play, sight see and even take naps. The entire process of checking luggage, boarding and loading was stress-free. The smooth trip offered great views and a chance to travel alongside friendly, eclectic people, which was an awesome experience for our children. A kind older woman showed my daughter how to needlepoint. On the return train we watched in awe as a young woman painted a beautiful landscape using portable water colors. Even the cafe attendant shared stories, joked with the children and initiated an impromptu dance party. Although we enjoyed the dining car, the food served was predominantly processed and the children’s menu was limited. Like most public transportation, there is the risk of one thoughtless or gassy (yuck) passenger who can affect the entire experience. Our outbound train left on time but arrived 45 minutes later than schedule. It wasn’t a big deal, however our return train was delayed five hours. Pack Layers: The departing train was so cold that we used our beach towels as blankets (efficient packing 101) to fend off frost bite. The trip home was more comfortable. Bring Snacks, Water and Maybe Meals: The dining cart’s hours are limited and the cafe selection is basic. If you have a picky eater or restrictive diet you will want to bring provisions. There is nowhere to heat it up so plan accordingly. 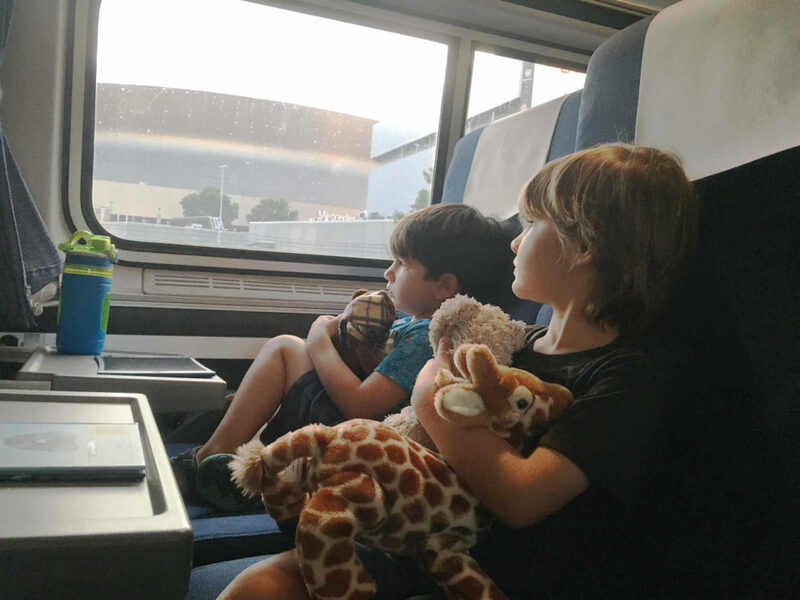 Plan Activities: We let each of the kids pack and carry their own backpack with crayons and a drawing pad, stuffed animals, dolls and a few travel-friendly games. Try to avoid small pieces or anything too loud. Don’t Rely on Electronics: WiFi is free but sketchy, and, in some areas, we lacked phone service. It was kind of nice to disconnect a bit. Make Friends with the Cafe Attendant: He serves the drinks. Once the kids were settled, the adults took turns sitting in the cafe and chatting with a glass of wine, beer or cocktail. It was much better than driving. Would We do it again? The results are mixed. We all enjoyed the travel time feeling more social than obligatory, and the vacation felt longer as a result. However the delays soured the experience. All in all, it might not be our primary form of travel but we are happy we took the adventure.